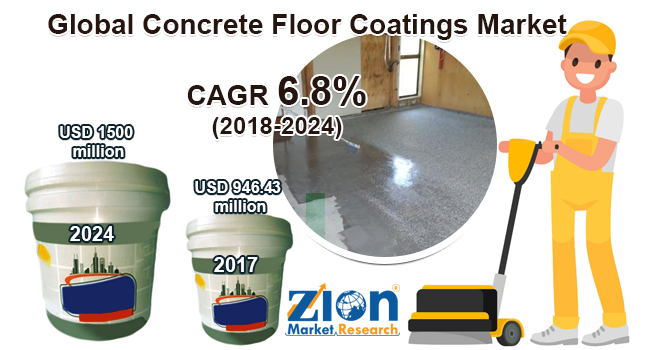 Zion Market Research has published a new report titled “Concrete Floor Coatings Market by Type (Epoxy, Polyaspartics, Acrylic, and Polyurethane) and by Application (Outdoor and Indoor): Global Industry Perspective, Comprehensive Analysis, and Forecast, 2017 – 2024”. According to the report, global concrete floor coatings market was valued at USD 946.43 million in 2017 and is expected to reach USD 1500 million in 2024, growing at a CAGR of 6.8% between 2018 and 2024. Concrete floor coatings provide a durable and reliable surface for industrial and commercial flooring. Concrete floor coatings are generally applied over concrete floors for durable surface and high performance; the smoothness provided by the concrete floor coatings can last for a longer period. For maintaining the floor in good condition, concrete floor coatings are used rapidly. Rapid economic growth in emerging economies is the key reason behind the expanding construction industry which is expected to propel the demand for concrete floor coatings in the years to come. The concrete floor coatings market is driven by various factors such as increasing awareness regarding the benefits of concrete floor coatings and the rapid growth in the industrialization and infrastructure is estimated to drive the concrete floor coatings market over the forecast period. However, high prices of raw materials, and energy and economic downturn in developed regions are expected to impede the growth of the market. Nevertheless, increase in commercial, residential, and industrial constructions will open major opportunities for the global concrete floor coatings during the projected years. The concrete floor coatings market is segmented into type, application, and region. In terms of the key type, the market is divided into epoxy, polyaspartics, acrylic, and polyurethane. Epoxy segment held the largest market share in 2017. Epoxy coatings are generally used in residential constructions such as staircase and parking. Epoxies have some special characteristics including low cost of the product as compared to counterparts and superior resistance against impact, chemical, and abrasion thus making it suitable for application in various sectors. Polyaspartics coatings market share is expected to exhibit a growth of around 6.8%. Polyaspartics coatings offer excellent resistance against UV radiations along with decent features, hence it is mostly preferred for outdoor applications such as runways and for an outdoor sports ground. Development in bio-based polyurethane for coating applications is anticipated to propel the demand for polyurethane concrete floor coatings. Furthermore, government regulations for environment safety will show a positive impact on the polyurethane demand over the projected years. Based on the applications, the global concrete floor coatings market is categorized into outdoor and indoor. Asia Pacific region is forecasted to have high growth potential for concrete floor coatings market. The growing construction and industrial development in the emerging economies such as Chain and India anticipate fueling the demand for concrete floor coatings market within the projected period. Europe and North America are forecasted to experience moderate growth rate over the forecast period. The Middle East and Africa and Latin America are anticipated to exhibit significant growth rate within the years to come owing to increase in construction activities and industrial development.